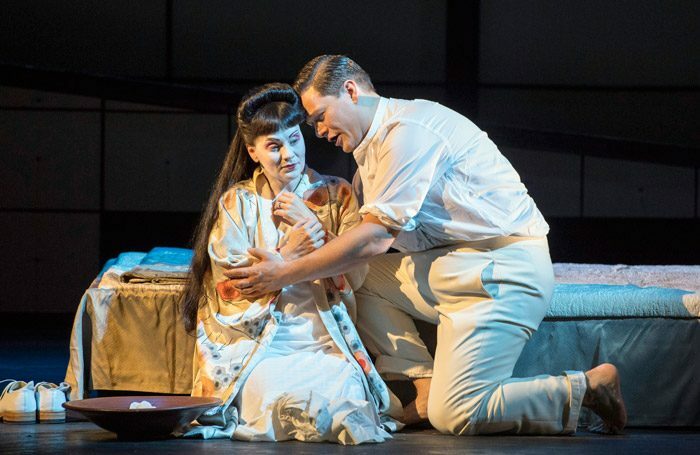 Puccini’s meltingly beautiful and bracing score for Madama Butterfly has acquired a new bitterness after the last few months of #MeToo revelations. There is clear child abuse here. Cio-Cio-San (Madama Butterfly) is just 15 when she finds herself swept into a marriage with an American lieutenant and abandoned with false promises that he will return. The romantic swell of the music, though as rousing and heart-stopping as ever, comes keenly loaded with other meanings now. Tim Albery’s production for Opera North premiered in 2007, long before this became a national conversation, but its formal sense of solemnity and stillness works well to amplify those concerns. Puccini’s Orientalist opera is given a specifically Japanese flavour in Hildegard Bechtler’s geometric design of slanted ramps, sliding panels and mountain vistas, as well as Ana Jebens’ gorgeous kimono costumes. The production has a static severity, not least in the long instrumental passage in which Butterfly awaits the return of Pinkerton as the superb Opera North orchestra under Martin Pickard’s baton comes to the dramatic fore. Albery boldly allows the stage picture to be held with very little movement, as an offstage reprise of One Fine Day is heard. Earlier, however, it sometimes threatens to drown some of the singers, with Merunas Vitulski’s vocally underpowered but physically solid Pinkerton a particular victim. But Anne Sophie Duprels’ Madama Butterfly is a shimmering glory, her voice soaring and dramatically heartbreaking. Sung in the original Italian, there is also notable support from Ann Taylor as Butterfly’s servant Suzuki and Peter Savidge as the American consul, who acts as messenger between Butterfly and Pinkerton.